Well, it’s episode #50 and I wanted to mark it with the first videocast in which you can see me at work. We look at the TOR habit and learn how to identify the Franciscan. Thanks to for all of your support whether its through Podcast Alley, the Frappr Map, leaving reviews over at iTunes, visiting the Forum, and most especially through prayers. You all are the best! To download this episode, click on the below or subscribe with iTunes or other podcatching software. This entry was written by sbeshonertor, posted on June 14, 2006 at 8:40 pm, filed under History, Podcast. Bookmark the permalink. Follow any comments here with the RSS feed for this post. Post a comment or leave a trackback: Trackback URL. Happy 50th Episode. I have listened since December and have enjoyed it very much. It’s nice to put a face to the voice. Congratulations on the 50th and here’s to another 50 more. I enjoy seeing you, so would love to see more video podcasts. 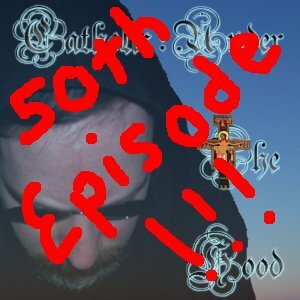 Dear Father Seraphim – I just watched the 50th episode of Catholic Under the Hood. I really enjoyed it! I am a regular subscriber and listener. You have a GREAT PRESENCE ON SCREEN. You should reconsider doing more video podcasts for Catholic Under the Hood. Congratulations on your 50th episode. Keep up the good work!